Dava's Grip Tip is the only pick with a patented overmolded rubber grip. Made from poly-gel. Dava's Grip Tip picks are a revolution in design. 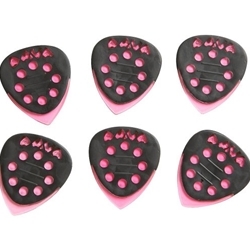 Utilizing patented over-molding technology and multi-gauge flexibility, musicians not only get a velvety fell and unparalleled grip, but also the ability to change pick gauge "on the fly." Grip the tip for a hard gauge or release the flexible center section for a smooth rhythm feel.